Jimmy Oliver sent this picture. This picture is from the 2006 show in Troy, Ala., at Troy University. The Blue Devils have long set a standard of excellence within the drum corps community, and I am a big fan of their corps. Having marched as a contra player for four years myself, I can appreciate those who run all over the field with heavy equipment. 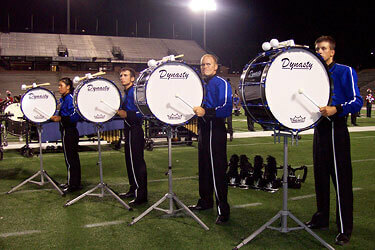 I can't wait to see what 2007 holds for the Blue Devils!